Siasa Duni: Benny Hinn: healer or hypnotist? Truth comes only to conquer those who have lost the art of receiving it as a friend. 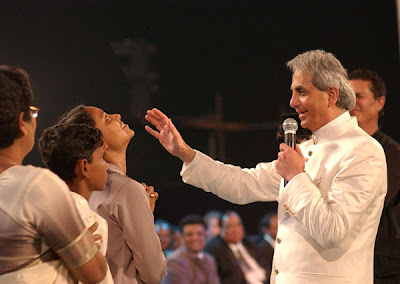 Benny Hinn: healer or hypnotist? Benny Hinn tours the world with his "Miracle Crusade," drawing thousands to each service, with many hoping for a healing of body, mind, or spirit. A significant number seem rewarded and are brought onstage to pour out tearful testimonials. Then, seemingly by the Holy Spirit, they are knocked down at a mere touch or gesture from the charismatic evangelist. Although I had seen clips of Hinn's services on television, I decided to attend and witness his performance live when his crusade came to Buffalo, New York, last June 28-29. Donning a suitable garb and sporting a cane (left over from a 1997 accident in Spain), I limped into my seat at the HSBC Arena, downtown. Benny Hinn was born in 1953, the son of an Armenian mother and Greek father. He grew up in Jaffa, Israel, "in a Greek Orthodox home" but was "taught by nuns at a Catholic school" (Hinn 1999, 8). Following the Six-Day War in 1967, he emigrated to Canada with his family. When he was nineteen he became a born-again Christian. Nearly two years later, in December 1973, he traveled by charter bus from Toronto to Pittsburgh to attend a "miracle service" by Pentecostal faith-healing evangelist Kathryn Kuhlman (1907-1976). At that service he had a profound religious experience, and that very night he was pulled from bed and "began to shake and vibrate all over" with the Holy Spirit (Hinn 1999, 8-14). Before long Hinn began to conduct services sponsored by the Kathryn Kuhlman Foundation. Kuhlman died before Hinn could meet her personally but her influence on him was profound, as he acknowledged in a book, Kathryn Kuhlman: Her Spiritual Legacy and Its Impact on My Life (Hinn 1999). Eventually he began preaching elsewhere, including the Full Gospel Tabernacle in Orchard Park, New York (near Buffalo) and later at a church in Orlando, Florida. By 1990 he was receiving national prominence from his book Good Morning, Holy Spirit, and in 1999 he moved his ministry headquarters to Dallas. Lacking any biblical or other theological training, Hinn was soon criticized by other Christian ministries. One, Personal Freedom Outreach, labeled his teachings a "theological quagmire emanating from biblical misinterpretation and extra-biblical 'revelation knowledge.'" He admitted to Christianity Today magazine that he had erred theologically and vowed to make changes (Frame 1991), but he has continued to remain controversial. Nevertheless, according to a minister friend, "Outside of the Billy Graham crusade, he probably draws the largest crowd of any evangelist in America today" (Condren 2001). Hinn's mentor, Kathryn Kuhlman, who performed in flowing white garments trimmed with gold (Spraggett 1971, 16), was apparently the inspiration for Hinn's trademark white suits and gold jewelry. From her he obviously learned the clever "shotgun" technique of faith-healing (also practiced by Pat Robertson and others). This involves announcing to an audience that certain healings are taking place, without specifying just who is being favored (Randi 1987, 228-229). And, oh, the joy that filled my soul! He touched me, and made me whole. . . .
Spraggett (1971, 17) says that with Kuhlman, as it was sung over and over, it became "a chant, an incantation, hypnotic in its effect," and the same is true of Hinn's approach. In time, the evangelist announces that miracles are taking place. At the service I attended, he declared that someone was being "healed of witchcraft"; others were having the "demon of suicide" driven out; still others were being cured of cancer. He named various diseases and conditions that were supposedly being alleviated and mentioned different areas of the anatomy-a back, a leg, etc.-that he claimed were being healed. He even stated that he need not name every disease or body part, that God's power was effecting a multitude of cures all over the arena. Thus, instead of the afflicted being invited up to be healed (with no guarantee of success), the "shotgun" method encourages receptive, emotional individuals to believe they are healed. Only that self-selected group is invited to come forward and testify to their supposedly miraculous transformation. While I remained seated (seeing no investigative purpose to making a false testimonial), others are more tragically left behind. At one Hinn service a woman - hearing the evangelist's anonymously directed command to "stand up out of that wheelchair!" - struggled to do so for almost half an hour before finally sinking back, exhausted (Thomas 2001). There is even a further step in the selection process: Of those who do make it down the aisles, only a very few will actually be invited on stage. They must first undergo what amounts to an audition for the privilege. Those who tell the most interesting stories and show the greatest enthusiasm are the ones likely to be chosen (Underdown 2001). Stage hypnotists, like successful trial lawyers, have long known their most important task is to carefully pick their subjects-for the stage as for a jury-if they expect to win. Compliance is highly desirable, and to determine this ahead of time, the stage magician will usually give several test suggestions to those who volunteer to come up on the stage. Typically, he may ask the volunteers to clasp their hands together tightly and then suggest that the hands are stuck together so that they can't pull them apart. The stage hypnotist selects the candidates who go along with the suggestion and cannot get their hands apart until he tells them, "Now, it's okay to relax and separate them." If he has too many candidates from the first test, he may then give them a second test by suggesting they cannot open their mouths, move a limb, or open their eyes after closing them. Those volunteers who fail one or more of the tests are sent back to their seats, and those who pass all the tests are kept for the demonstration. Needless to say, not only are they compliant, cooperative, and suggestible, but most have already made up their minds in volunteering to help out and do exactly as they are told. Once on stage, one of Hinn's screeners announces each "healed" person in turn, giving a quick summary of the alleged miracle. At the service I attended, one woman put on a show of jumping up and down to demonstrate that she was free of pain following knee surgery three weeks before. Another was cured of "depression," caused by "the demon," said a screener, that resulted from "an abusive relationship with her husband." Still another (who admitted to being "an emotional person") said her sister-in-law sitting beside her had begun to "speak in tongues" and that she herself felt she was healed of various ailments, including high blood pressure and marital trouble. At her mention of her brother, Hinn brought him up and learned he had been healed of "sixteen demons" two years previously, and expected to be cured of diabetes; Hinn prayed for God to "set him free" of the disease. Another was supposedly cured of being "afraid of the Lord" (although he was carrying the bible of a friend who had died of AIDS), and one woman stated she believed she had just been cured of ovarian cancer. In each instance-after the person has given a little performance (running about, offering a sobbing testimonial, etc. ), and Hinn has responded with some mini-sermon, prayer, or other reaction-the next step in the role-playing is acted out. As one of his official catchers moves into place behind the person, Hinn gives a gesture, touch, or other signal. Most often, while squeezing the person's face between thumb and finger, he gives a little push, and down the compliant individual goes. 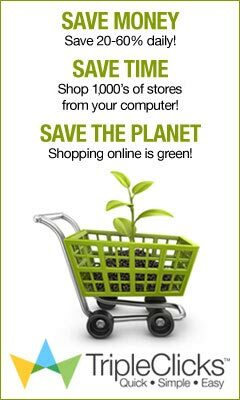 Some slump; some stiffen and fall backward; a few reel. Once down, many lie as if entranced, while others writhe and seem almost possessed. Along with speaking or praying in tongues (glossolalia) and other emotional expressions, this phenomenon of "going under the Power" is a characteristic of the modern charismatic movement (after the Greek charisma, "gift"). Also known as being "slain in the Spirit," it is often regarded skeptically even by other Christians who suspect-correctly-that the individuals involved are merely "predisposed to fall" (Benny Hinn: Pros & Cons 2002). That is, they merely engage in a form of role-playing that is prompted by their strong desire to receive divine power as well as by the influence of suggestion that they do so. Even the less emotionally suggestible people will be unwilling not to comply when those around them expect it. In short, they behave just as if "hypnotized." Although popularly believed to involve a mystical "trance" state, hypnosis is in fact just compliant behavior in response to suggestions (Baker 1990, 286). One professional hypnotist said of Hinn's performance: "This is something we do every day and Mr. Hinn is a real professional" (Thomas 2001). But what about the healings? Do faith-healers like Benny Hinn really help nudge God to work miracle cures? In fact, such claims are invariably based on negative evidence-"we don't know what caused the illness to abate, so it must have been supernatural"-and so represent the logical fallacy called "arguing from ignorance." In fact, as I explained to a reporter from The Buffalo News following a Benny Hinn service, people may feel they are healed due to several factors. In addition to the body's own natural healing mechanisms, there is the fact that some serious ailments, including certain types of cancer, are unpredictable and may undergo "spontaneous remission"-that is, may abate for a time or go away entirely. Other factors include even misdiagnosis (such as that of a supposedly "inoperable, malignant brain-stem tumor" that was actually due to a faulty CT scan [Randi 1987, 291-292]). And then there are the powerful effects of suggestion. Not only psychosomatic illnesses (of which there is an impressive variety) but also those with distinct physical causes may respond to a greater or lesser degree to "mental medicine." Pain is especially responsive to suggestion. In the excitement of an evangelical revival, the reduction of pain due to the release of endorphins (pain-killing substances produced by the body) often causes people to believe and act as if they have been miraculously healed (Condren 2001; Nickell 1993; Nolen 1974). Critical studies are illuminating. Dr. William A. Nolen, in his book Healing: A Doctor in Search of a Miracle (1974), followed up on several reported cases of healing from a Kathryn Kuhlman service but found no miracles-only remissions, psychosomatic diseases, and other explanations, including the power of suggestion. More recently a study was conducted following a Benny Hinn crusade in Portland, Oregon, where seventy-six miracles were alleged. For an HBO television special, A Question of Miracles (Thomas 2001), Benny Hinn Ministries was asked to supply the names of as many of these as possible for investigation. After thirteen weeks, just five names were provided. Each case was followed for one year. The first involved a grandmother who stated she had had "seven broken vertebras" but that the Lord had healed her at the evening service in Portland. In fact, x-rays afterward revealed otherwise, although the woman felt her pain had lessened. The second case was that of a man who had suffered a logging accident ten years previously. He demonstrated improved mobility at the crusade, but his condition afterward deteriorated and "movement became so painful he could no longer dress himself." Yet he remained convinced he was healed and refused the medication and surgery his doctors insisted was necessary. The next individual was a lady who, for fifty years, had only "thirty percent of her hearing" as claimed at the Portland crusade. However, her physician stated, "I do not think this was a miracle in any sense." He reported that the woman had had only a "very mild hearing loss" just two years before and that she had made "a normal recovery." The fourth case was that of a girl who had not been "getting enough oxygen" but who claimed to have been healed at Hinn's service. In fact, since the crusade she "continued to suffer breathlessness," yet her mother was so convinced that a miracle had occurred that she did not continue to have her daughter seek medical care. Finally, there was what the crusade billed as "a walking dead woman." She had had cancer throughout both lungs, but her doctors were now "overwhelmed" that she was "still alive and still breathing." Actually, her oncologist rejected all such claims, saying the woman had an "unpredictable form of cancer that was stable at the time of the crusade." Tragically, her condition subsequently deteriorated and she died just nine months afterward. As these cases demonstrate, there is a danger that people who believe themselves cured will forsake medical assistance that could bring them relief or even save their lives. Dr. Nolen (1974, 97-99) relates the tragic case of Mrs. Helen Sullivan who suffered from cancer that had spread to her vertebrae. Kathryn Kuhlman had her get out of her wheelchair, remove her back brace, and run across the stage repeatedly. The crowd applauded what they thought was a miracle, but the antics cost Mrs. Sullivan a collapsed vertebra. Four months after her "cure," she died. Nolen (1974, 101) stated he did not think Miss Kuhlman a deliberate charlatan. She was, he said, ignorant of diseases and the effects of suggestion. But he suspected she had "trained herself to deny, emotionally and intellectually, anything that might threaten the validity of her ministry." The same may apply to Benny Hinn. One expert in mental states, Michael A. Persinger, a neuroscientist, suggests people like Hinn have fantasy-prone personalities (Thomas 2001). Indeed, the backgrounds of both Kuhlman and Hinn reveal many traits associated with fantasy-proneness, but it must be noted that being fantasy prone does not preclude also being deceptive and manipulative. Hinn notes that only rarely does he lay hands on someone for healing, but he made an exception for one child whose case was being filmed for the HBO documentary. The boy was blind and dying from a brain tumor. "The Lord's going to touch you," Hinn promised. The child's parents believed and, although not wealthy, pledged $100 per month to the Benny Hinn Ministries. Subsequently, however, the child died. I hope there is a special place in Hell for people who try and enrich themselves on the suffering of others. To tantalize the blind, the lame, the dying, the afflicted, the terminally ill, to dangle hope before parents of a severely afflicted child, is an indescribably cruel thing to do, and to do it in the name of God, to do it in the name of religion, I think, is unforgivable. Very, very excellent post. Thank you. He has been to over 7 different Hinn crusades and has seen the things the camera never shows... Not to mention he has cerebral palsy... He spoke at my church and comes highly recommended by my pastor, Dr. John MacArthur. "Amnesty can only be granted when one has been tried and convicted. If we brush aside violations without acknowledging we may encourage another chapter of chaos in the country." "In 1980, Museveni went to the bush claiming that the elections were rigged. Now he is the same man congratulating Kibaki whose victory is being disputed. This is the saddest thing the President has done to East Africa." "I do not know whether Kibaki won the election." Zimbabwe "is an embarrassment to Africa"
Will Bemba lead the ICC to Uganda?